Gorgeous views from every window of the house! Inviting entry. Gleaming hardwood flooring throughout. Spacious living room includes cozy stone fireplace and French door access to the screened-in deck. Sparkling chef's kitchen boasting an abundance of white cabinetry, stainless steel appliances, recessed lighting, breakfast bar and an eating area. Escape to the master bedroom that offers you a vaulted ceiling, generous closet space and a private bathroom with his/her vanities with granite counters. 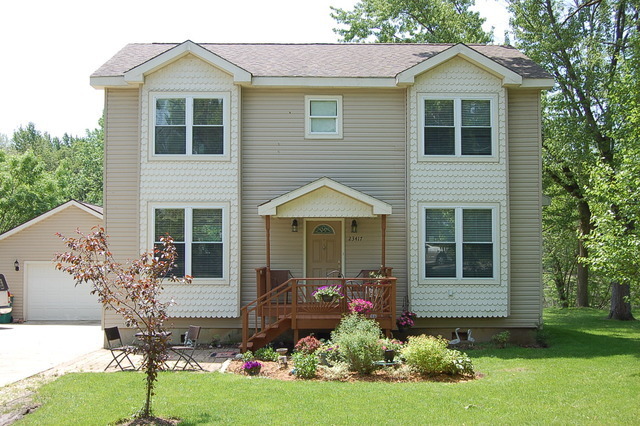 Two additional bedrooms, a full bathroom with and a laundry room complete the second floor. Enjoy the outdoors in the screened-in deck overlooking panoramic views. The perfect place to call home! Lake Rights!